Last night it was a solo supper evening. When these occur, I usually have a “Chris meal,” or, a very large salad with lots of “accessories.” I went to my usual Thursday night yoga class and halfway through my dazed savasana, I awoke to one word: pasta. I had such a craving. I try to stay away from most carbohydrates, but that evening I was focused and couldn’t get it out of my head. As I was driving home after class, I knew exactly what I was going to do. I had a rather sad looking container of mushrooms that needed attention, a few grape tomatoes, and much to my pleasure, some linguini. As the water was getting ready to boil, I minced some garlic and red onion together, heated a little bit of olive oil and butter, and once melted, added the garlic and onion and cooked at low heat. As these were cooking, I sliced the mushrooms. Once the garlic was just about soft, I added the mushrooms and cooked these also at a low heat until they released their juices and became very soft. I sliced the grape tomatoes, put the pasta in for 8 minutes, and waited–and took the compost out. 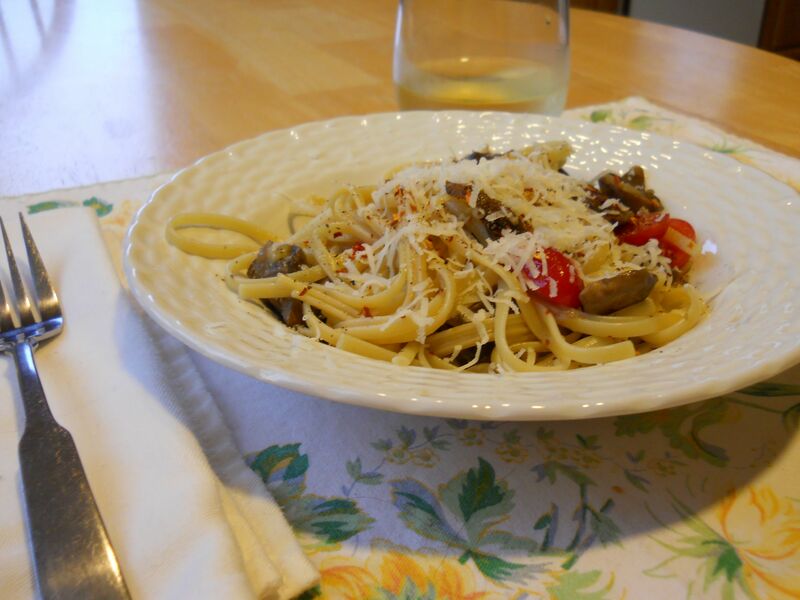 In a large mixing bowl, I added the mushrooms, cooked pasta, tomatoes, and tossed. A couple splashes of white wine (if you don’t drink alcohol, you can use vinegar or lemon for some brightness, or leave out), and ground some black pepper and added some salt and crushed red pepper for heat (of course, you can always leave that out as well). After incorporating all the ingredients, I placed a helping in a bowl, grated some cheese on top, and sat to eat with a small glass of wine and the latest Consumer Reports. I was in heaven. I did end up eating my salad, albeit a much smaller one. Just the way I like it, greens with a little bit of olive oil and vinegar. Sometimes varying from the traditional can make for a very happy supper.